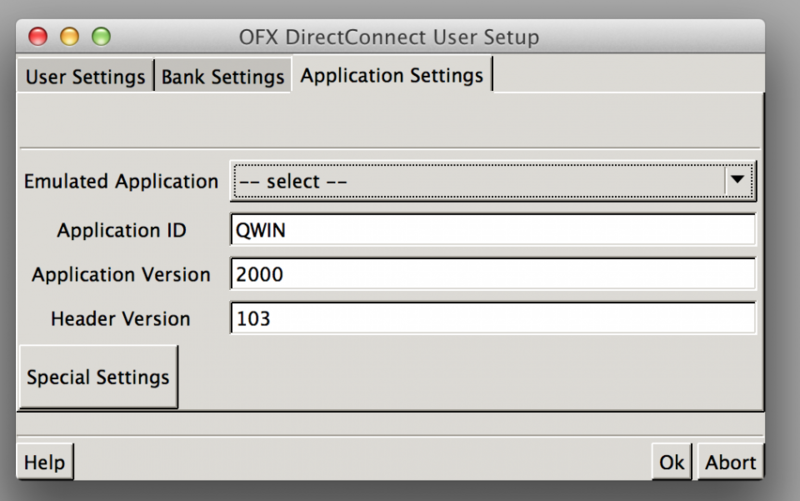 Follow the instructions for Setting up OFXDirectConnect in GnuCash 2. 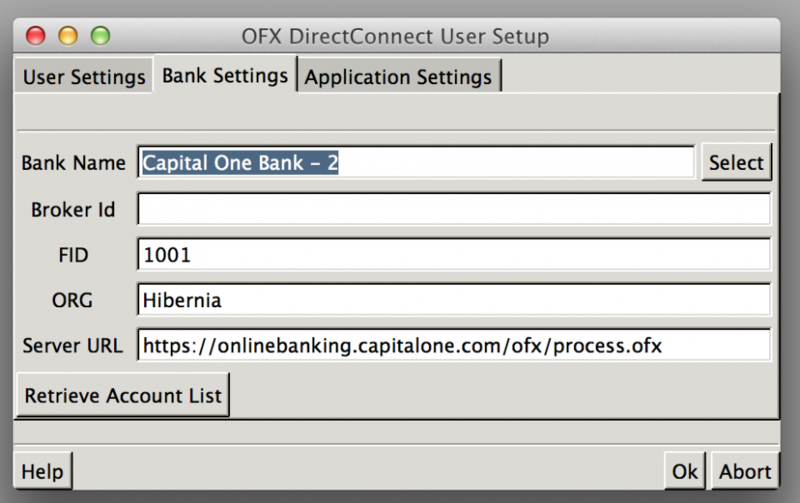 Under Bank Settings, grab the Capitol One bank info by clicking the Select button and searching. Hit OK to save. 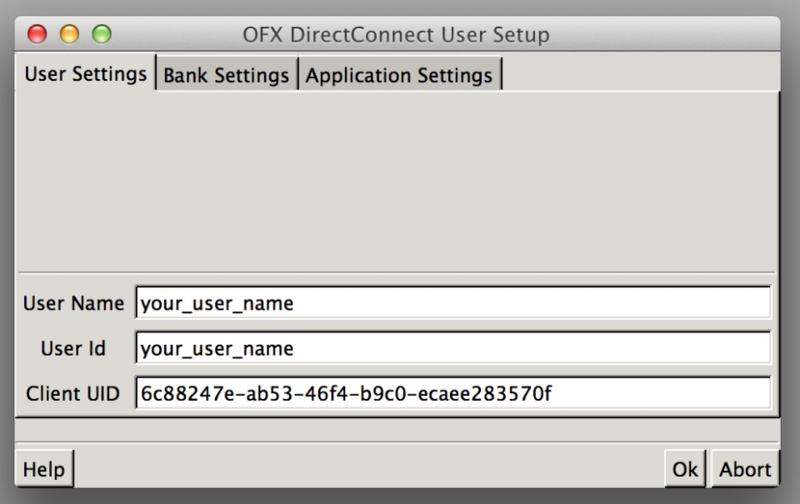 Now, you should be able to return to the Bank Settings tab to Retrieve Accounts! 19:09:34 Sending request... 19:09:34 Connecting to server... 19:09:34 Resolving hostname "onlinebanking.capitalone.com" ... 19:09:34 IP address is "208.80.50.50" 19:09:34 Connecting to "onlinebanking.capitalone.com" 19:09:35 Connected to "onlinebanking.capitalone.com" 19:09:36 Connected. 19:09:36 Sending message... 19:09:37 Message sent. 19:09:37 Waiting for response... 19:09:37 Receiving response... 19:09:39 HTTP-Status: 200 (OK) 19:09:39 Response received. 19:09:39 Disconnecting from server... 19:09:39 Disconnected. 19:09:39 Parsing response... 19:09:39 Parsing response 19:09:39 Status for signon request: General error (Code 2000, severity "ERROR") Error other than those specified by the remaining error codes. (Note: Servers should provide a more specific error whenever possible. Error code 2000 should be reserved for cases in which a more specific code is not available.) 19:09:39 Status for account info request: General error (Code 2000, severity "ERROR") Error other than those specified by the remaining error codes. (Note: Servers should provide a more specific error whenever possible. Error code 2000 should be reserved for cases in which a more specific code is not available.) 19:09:39 Operation finished, you can now close this window. 19:09:34 IP address is "208.80.50.50"
19:09:39 Operation finished, you can now close this window.